The Oracle CAST function is quite powerful, but it can be hard to use. Learn how to use it and what it can do in this article. The purpose of the Oracle CAST function is to convert one data type to another. It allows for more functionality than the TO_NUMBER, TO_CHAR and TO_DATE functions, as it allows you to specify the actual data types you want to convert to, rather than just use the defaults of those functions. 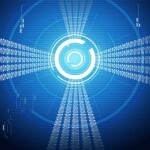 Related: How to Convert Data Types in Oracle SQL. This structure is a little different as it does not separate the parameters by a comma, as many other functions do. Instead, it has the word “AS”. expr (mandatory choice): This is the value or expression that is to be converted to another data type. See below for the valid data types. MULTISET (optional): This keyword indicates that the subquery results will return multiple rows, and are then CAST into a collection value. If this is omitted, and the subquery returns multiple rows, it will only return a single row. subquery (mandatory choice): This is the subquery that can be run to be converted into a collection data type. type_name (mandatory): This is the Oracle data type that the expr or subquery will be converted to. See below for the valid data types. Subscribe and get a PDF cheat sheet of all of the Oracle SQL functions and parameters for easy reference! The Oracle CAST function can only convert to and from certain data types. This table from Oracle shows which types are compatible. The Datetime/Interval column includes DATE, TIMESTAMP, TIMESTAMP WITH TIMEZONE, INTERVAL DAY TO SECOND and INTERVAL YEAR TO MONTH. You cannot cast a UROWID to a ROWID if the UROWID contains the value of a ROWID of an index-organized table. CAST does not support any of the LOB data types. If you try to CAST a CLOB into a character data type, for example, the LOB value is converted to a character value and then converted to the target data type. If the resulting value is larger than the target type, then you’ll get an error. Want to see articles like this on all of the other Oracle functions? Check out this page which lists all of the functions and guides for each of them. Here are some examples of the Oracle CAST function. I find that examples are the best way for me to learn about code, even with the explanation above. First of all, let’s set up the CUSTOMERS table. We can see the data in the customers table that will be used for a few examples below. This example shows how to CAST from a string value that contains a date, to a date data type. Notice how the date in the output value is displayed in the date format for Oracle. This example shows how to cast a number to a CHAR data type. It can be hard to see in this example but the alignment is different in the SQL Developer tool, which is done for different data types. This example shows how to convert a VARCHAR to a NUMBER. I’ve put spaces around the first number value, which have been removed when it has converted to a NUMBER data type. This example shows how to cast a DATE value to a TIMESTAMP value. For this example, I’ve used the CUSTOMERS table shown above. Each of the DATE value has been converted to a TIMESTAMP which includes hours, minutes, seconds, and fractional seconds. This example shows how to convert a NUMBER value to a VARCHAR2 data type. This is similar to Example 2. It can be hard to see in this example but the alignment is different in the SQL Developer tool, which is done for different data types. This example is a simple example of how to use a multiset subquery with cast. First, we look at the customers table to find employees in the USA. Then, we create a new TYPE to store VARCHAR2 values. Then, we write our SQL to return a value of that type. As you can see, it returns one value. This value is of type “usa_employee_first_names” and includes several values. It can then be used for other purposes, such as inserting into a table. TO_NUMBER – This function converts a character value to a NUMBER data type. TO_CHAR – This function converts a number or date value to a CHAR data type. TO_DATE – This function converts a character value to a DATE-related data type. You can find a full list of Oracle functions here. 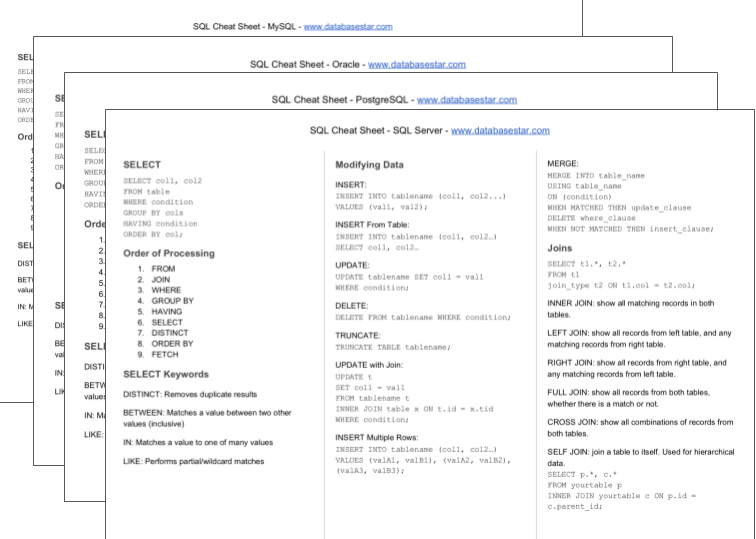 Three pages of SQL commands - print it or use it as a quick reference.